Upcoming PPS Foundation Events: Please join us! Join us for our 22nd Annual Golf Outing at the Country Club of Peoria on Monday, June 24, 2019! 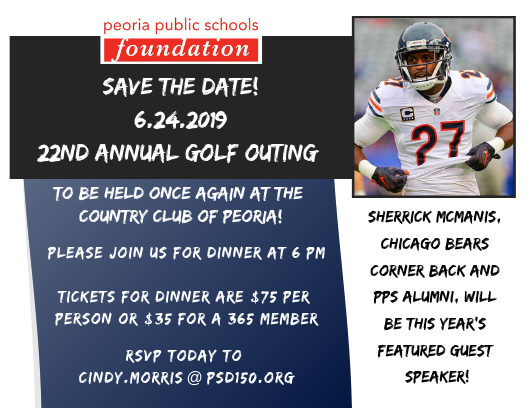 Chicago Bears Corner Back and PPS Alum, Sherrick McManis, will be this year's featured dinner speaker! Click here to print a copy of the registration to golf or to attend just the dinner. New for this year - a maximum of 120 golfers so register early to secure your spot! Not golfing? You can still join us for dinner! Also Save the Date for the following events! Thank you to all who booted up for our 365 Breakfast this year! We have raised over $40,000 for our 365 Fund. Still want to donate and join the 365 Annual Giving Program? Click here to download a donation form. Please mail form and payment to address listed on the sheet. The 2nd Annual Peoria Schoolhouse Open was held on January 26, 2019. With the help of 132 participants and 20 plus volunteers, $5000 was raised for the Peoria Public Schools Foundation designated to PPS middle schools to purchase new athletic uniforms and equipment. Look for more information to come for next year's event! New this year! We celebrated the start of a new school year with a successful event that raised money to purchase uniforms for Peoria Public School students. A huge thank you to everyone who came out and supported this event. An especially big thank you to our event sponsors: CMI (Commericial Mechanical, Inc), Associated Bank and Mosquito Authority. This event also couldn't have been possible without the support of Peoria Riverfront Museum, Dexter O'Neal & the Funkyard, Cami Proctor, Alwan & Sons Meat Company, Uncle Bob's Homemade Ice Cream, and Kitchen Cooked Chips. We raised over $2700-- which will allow us to purchase hundreds of new uniform shirts and pants for students in need. Our goal is to raise a total of $10,000 during this school year. Our Uniform Fund has helped thousands of students who otherwise would not have proper clothing for school. Please help us reach this goal by clicking here to donate today. You will truly be making a difference in the life of a student! Thank you all who contributed to making the 21st Annual Golf Outing one of the best yet! We were able to raise $55,000 to support the different programs we administer throughout the year. Our next Golf Outing will be held on Monday, June 24, 2019 at the Country Club of Peoria. Please save the date and look for more information to be posted in the early months of 2019.